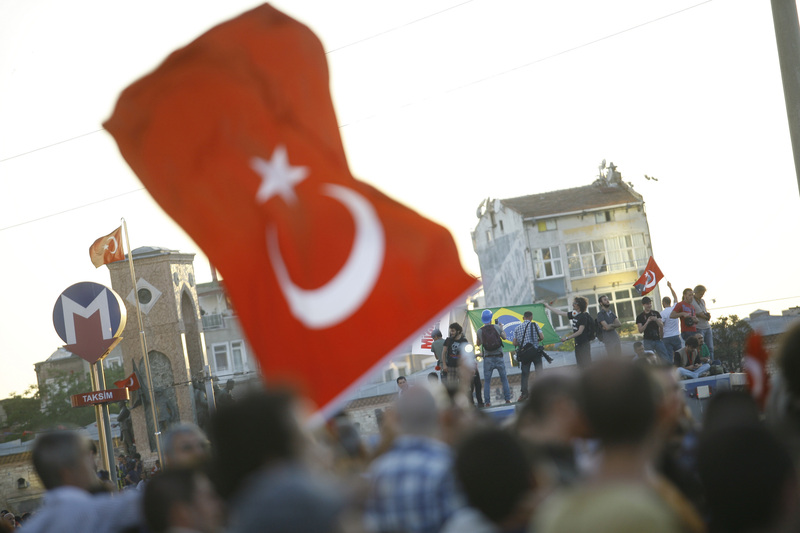 Not so long ago, Taksim Square became a familiar name to people around the world, after protests erupted in Turkey's capital, violence ensued, and Turkish Prime Minister Tayyip Erdogan faced the “worst political crisis since coming to power a decade ago." Now, the situation in Turkey is again threatening to become tumultuous: On Saturday, hundreds of protests pooled into Istanbul and Ankara to protest a draconian new Internet censorship law, only days after a terrifying medical bill was signed that criminalizes the administrating of emergency first aid without government authorization. As was the case in the summer demonstrations, riot police quickly intervened in Saturday's protests, firing plastic bullets, tear gas and water cannons at the thousands of people gathered in the Turkish capital. Some demonstrators threw firebombs at the policemen, and were subsequently arrested, but no injuries have, as of yet, been reported. The new law they're protesting gives Turkey's telecommunications ministry the power to block websites and remove content accused of "violations of privacy," or that is "discriminatory or insulting towards certain members of society," without a court order — effectively enabling mass censorship, in a country that already has sites like Vimeo being blocked. It would also force service providers to keep Internet users' data for two years. "Its adoption would be fraught with consequences for the fundamental freedoms of Internet users and the Turkish digital economy. We urge parliamentarians to revise this bill completely in consultation with civil society and taking account of the European Court of Human Rights' criticism of current legislation," the group Reporters Without Borders said. The protests are already being fueled by a social media campaign, with the hashtag #sansürüdurdur (hands off my internet) being used to gather more demonstrators via Twitter. If the protests keep going, though, there's a chance that the situation will get violent — a risk that's much more dangerous now that President Abdullah Gul signed into law a measure that makes it illegal to administer emergency first aid without the government's ok, and bans doctors from practicing outside state medical institutions. Doctors who break that law face up to three years in prison or a fine of almost $1 million. It's easy enough to see how the law could be used to deter medical professionals from treating people wounded in demonstrations. “Passing a bill that criminalizes emergency care and punishes those who care for injured protesters is part of the Turkish government’s relentless effort to silence any opposing voices,” said Dr. Vincent Iacopino, senior medical adviser at Physicians for Human Rights. This summer, over 8,000 protestors were wounded during the violence of the demonstrations, and three were killed. With Erdogan now fending off a growing corruption scandal, repressive laws continuing to pass, and demonstrations erupting across the country — Turkey is definitely a place to keep your eye on again.